The world peace flag is based on a design by the Russian artist and mystic Nichola Roerich, who proposed the red circle with three dots inside as an international symbol to mark museums, schools, and similar cultural landmarks to prevent destruction by aerial bombs ... this about the time of World War I. The idea was similar to the large red cross that marks hospitals and hospital tents in war zones ... similarly to "prevent" bombing and strafing of helpless patients and medical personnel. The concept has been lost in today's world. Nikola Reriq | Никола́й Ре́рих was a Latvian descent Russian mysticist, painter and philosopher (approx. 1870-1946; original German spelling "Roerich"). He is very popular in nowadays Russia, where his followers are organized in a cultural movement more or less related with “New Age” tendencies. They use as their symbol the device shown above — which was originally designed by Roerich himself and it is charged with some more or less deep symbolism: from memory, the three dots stand for art, science and philosophy (including religion), encircled and bounded together to form culture: "∴⃝". This symbol appears on one of Roerich’s paintings, Madonna Oriflamma, from 1932, which depicts Saint Mary holding and showing a white cloth with it. In Russia this symbol would be identified nowadays as that of a religious/philosophical group, and nothing more nor less. The one-over-two-dots symbol (no ring) is usually used in cartography to denote important historical remains, usually ruins; maybe it is connected to the Roerich flag, I don't know. Note that the shade of red used in this flag is slightly darker than usual. This is not a mistake. Every instance I found of the symbol was shown in darker shades of red. Well, there's no specific design or, if there is, not all flags conform to it. But since we seem to have lost the original source, let me make a drawing after the specimen donated by the International Centre of the Roerichs to the United Nations (see photograph above). It's a 2:3 white flag, with a centred dark red charge consisting of a circle, 3/4 of the hoist in diameter and 1/12th of the hoist wide, with centred in it 3 disk touching, each 1/6th of the hoist in diameter, placed 1 over 2. By chance I came across this site (in Spanish and English) that extensively uses the flag of the Roerich Peace Movement. What we have as the Roerich Peace Movement in our page is not one centralized organization, but rather a grabbag name of several entities which, with different approaches, claim to follow the teachings and examples of Nikolai Rëriq; it should perhaps be renamed to Roerich peace movement (lower case). This Comité Internacional de la Bandera de la Paz seems to be one of those organizations. At a broken link, we can see an actual flag photo, with the International Banner of Peace hoisted outdoors on a high pole apparently in Araçatuba, Brazil. I don't know how extensively has the pact flag been used. 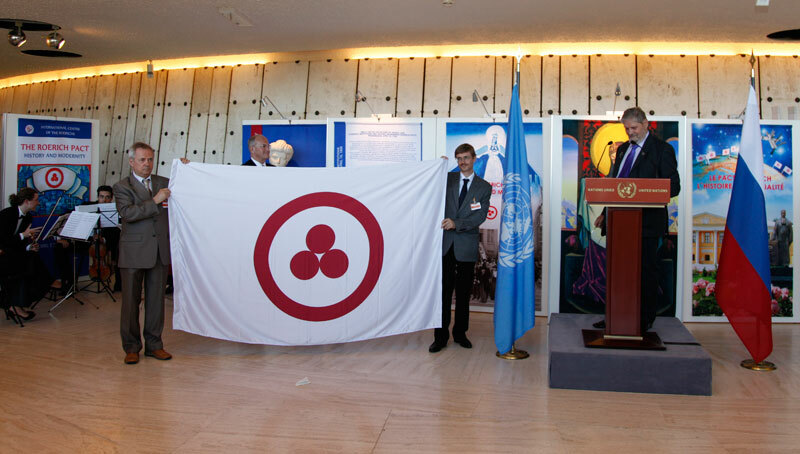 On the FOTW mirrors we show the flag of the Roerich Movement, the so-called "International Peace Banner." 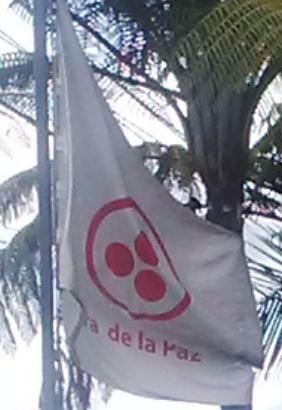 It is a white flag with 3 red disks within a red ring. The illustration on FOTW shows the disks arranged in a pyramidal shape: 2 on the bottom and 1 on top, with slight separations between the disks. There are 2 links to outside graphics which seem to confirm that arrangement. One is broken, but can be retreived by redirecting the link to an archived copy. However, for what it's worth, a photograph of an actual flag [broken link] shows the arrangement slightly different: the disks are touching and arranged one above, one below, and one midway between and offset towards the hoist. An article in "Symbol und Wirtschaft" from 1950 [dum50a] shows the Roerich flag with one disk on the bottom and two on top. Dr. Nikolaus Roerich had made several proposals (in 1904 and 1914) for the protection of cultural goods. Only in 1931/32 he succeeded to organize international conferences (in Brügge), again in 1933 in Washington, for this purpose. The Roerich Pact was signed 15 April 1935. Roerich has derived the symbol from an old Indian symbol, the "Chintamani," that he believed to find also in temples in Peking, Tibet, in the symbol of rule of the 14th Century Mongolians ("Tamga"), in the arms of Samarkand, on Egyptian and Coptian antiquities and in Himalaya countries. The author of the article (Dumke) closes with a sceptical sentence about the historical basis of Roerich's assumptions. Interesting! Could it be a vertical hanging flag hoisted as a "normal" flag? For what it's worth, all Roerich flags I saw (and I saw quite a few, thanks to my 1999-2000 contacts in the Russian "esoteric scene") have the discs set 1+2, as in the Madonna Oriflamma painting. I hadn't thought of that, but don't see any reason why it couldn't be possible, and of course prompts curiosity whether the photo of the 2-over-1 flag photo reported by Marcus might not simply be an upside down hoisted flag. This is actually the International Banner of Peace, aka the Roerich Movement flag. On the other hand, though, I don't know what to make of banderadelapaz.org. I did notice that most flags there have the word "PAX" under the symbol. Would it be possible then, that the Roerich Movement flag may have variants having the word "peace"in different languages, or is this a wrong depiction (and local adaptation) of the flag that happened in my country? While in the general sense. I have to say that it's possible. However, the banners of the International Committee for the Banner of Peace all seem to have either the Spanish text or just the word PAX. I was recently in Mexico, and in Cozumel Island, when I asked for the white Quintana Roo Flag, they sent me to a park where they believe that was hoisted. In fact, the white flag in the park was the international peace flag. The version I saw bore the inscription PAX, but I believe that in Latin America is not the most frequently used version. I don't recall how this was for Esteban's original report, but the flag we show on the page is not in fact in all capitals. I've found that for most specimen where I was able to determine the case from Internet photographs, only the first letters of the two nouns were capitalised. At http://en.icr.su/news/index.php?news=2785, three versions are in the same ceremony, and the text allows for the difference being caused by their different origin, but unfortunately it doesn't seem to mention which is which. For the PAX version, I tried to create an average flag, as there's clearly no unity of design. This drawing is for a 3:5 white flag, with a centred dark red charge 3/4th of the hoist in height, consisting of the text PAX, 1/3rd of the hoist wide, in a bold sans font 1/6th of the hoist in height, with over it a circle, 1/2 of the hoist in diameter and 1/24th of the hoist wide, with centred in it 3 disk almost touching, each 4/27th of the hoist in diameter, placed 1 over 2.